Rizzilient the mako shark is dead. The 84 pound, five foot shark was tagged during the Montauk Marine Basin, Shark’s Eye tournament in Montauk, New York on July 18, 2013. The tournament was the first ever catch and release shark tournaments in Montauk. During the tournament four sharks were tagged with satellite trackers. Each time the sharks tagged broke the surface, a ping was sent by satellite, which was then plotted on the shark tracking website OCEARCH.org. Mako shark Rizzilient’s final tracking path. On March 13, Rizzilient’s satellite tracking tag was pinging off the coast of coast of Portugal, near Vila do Conde. 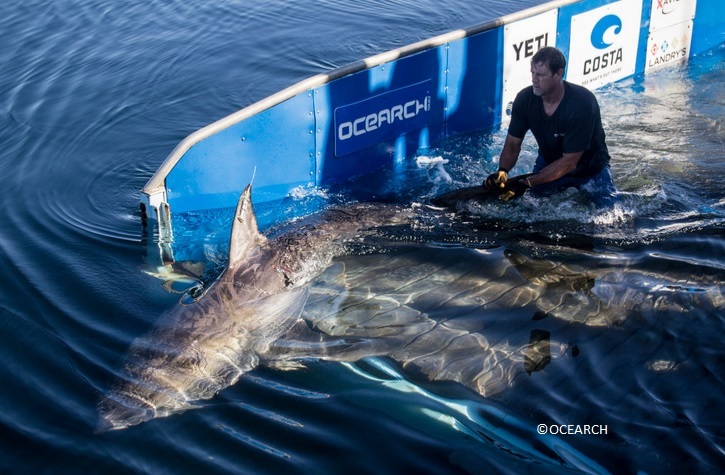 OCEARCH founder Chris Fischer believes the shark may have been killed in February when it was caught by a fishing vessel in the mi-Atlantic Ocean. It would have then been driven to port. “There was a boat that came through there about a week or so ago, that apparently dropped off a lot of sharks. We’re just trying to understand with a little more depth what happened.” Mr. Fischer told the Global News. The death of Rizzilient highlights the global need for conservation. “In all likelihood, what they [the fisherman] were doing was perfectly legal, so they can’t be accused of harvesting a shark that they’re not allowed to harvest,” Massachusetts Shark Research Program leader Greg Skomal said. “The experiment’s over at this point. It would be great to get the tag back, either to redeploy or to see if it’s got any archived data on it…to learn more. The language barriers…[fishermen] might think it’s a routinely tagged shark, and that landing it would provide more information. Then I would expect them to report it to us,” Skomal said. While the tags have contact information written in five different languages, it is unknown if one is Portuguese.